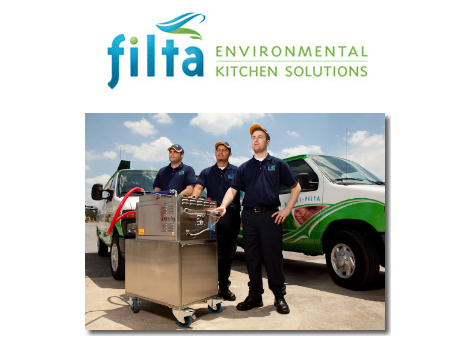 How do I buy a Filta Environmental Kitchen Solutions Franchise? The Flagship of the Filta Group Brand. FiltaFry is the original cooking oil filtration & fryer management business. The service is an eco-friendly, mobile, on-site service for the micro-filtration of cooking oil and the vacuum based cleaning of deep fryers. The easy to sell client benefits of FiltaFry's proven fryer management system is the ideal solution for restaurants looking to improve food quality, reduce liability, reduce frying costs, and decrease their impact on the environment due to waste cooking oil. FiltaFry has a simple and effective strategy for developing a new client base. On average, over 50% of restaurants who demo the service become long term customers. Open Filta Environmental Kitchen Solutions in any of these available states: AK, AL, AR, AZ, CA, CO, CT, DC, DE, FL, GA, IA, ID, IL, IN, KS, KY, LA, MA, MD, ME, MI, MN, MO, MS, MT, NC, ND, NE, NH, NJ, NM, NV, NY, OH, OK, OR, PA, RI, SC, SD, TN, TX, UT, VA, VT, WA, WI, WV, WY. How Can a Filta Franchisee Be So Profitable? Filta: Involves the residual income of a weekly repeat service to their customers in an exclusive, protected territory. Filta: Offers multiple streams of revenue to Franchisees by providing multiple, eco-friendly services to their customers. Filta: Only requires a small customer base per van (30-40). Filta: Can be run from home, with low overheads, simple administration and minimum stock. Filta: Is in demand because of the increasing global trend of environmental sustainability. Filta: Provides a safe, hygienic and efficient solution to one of the most problematic areas of the kitchen: the fryers. Filta: Has little to no competition in most markets. Filta: Is Internationally recognized and already in 44 of the United States. Again designed to help Filta franchise owners increase the RPC, the waste oil collection service, FiltaBio has been introduced. Once the cooking oil has come to the end of its life, franchise owners can collect the oil and immediately remove it safely from the customer’s site - no waste oil drums or containers continually attracting rats and other unwanted issues. From there, the oil is purified and sent to be made into biodiesel, the safe and environmentally friendly alternative to petrochemical based diesel. The result is a revenue generating service offered from the same van with little additonal workload. Designed to help Filta franchise owners increase the RPC (revenue per customer), FiltaCool is designed to offer additonal needed services to clients and improve profitability for franchise owners. In tandem with the FiltaFry service, FiltaCool is the most effective moisture control system available for businesses who need to control moisture in walk in coolers. The result for customers is lower electricity bills, lower maintenance costs on refrigeration systems, and food that stays fresh longer, thus reducing waste. The result for Filta franchise owners is increased RPC with almost no additional work load. Our client base is continuously growing. Potential and current customers include restaurants, hotels, schools, colleges and universities, grocery stores, stadiums, arenas, corporate cafeterias, institutional cafeterias, airports, sporting venues – in fact, anywhere food is fried and/or there are cold storage units. Upon being granted a Franchise, a new Franchisee will attend an intensive 2 week training program at Filta’s headquarters in Orlando, Florida. Franchisee’s learn our proven sales strategies as well as best operating procedures to acquire their customers, and just as importantly, keep them happy. These techniques have been developed and continuously improved over the past 15 years. When the Classroom and Field Training complete, Franchisee returns to their Territory to open operations. Filta provides Franchisee with inside sales as well as a Business Development Manager to assist in the start up. The combined efforts in training are designed to enable our Franchisees to build a solid customer base and offer them all of our current service offerings as well as any additional services that may be offered in the future. Is Prior Business Experience Necessary? While the Filta franchise opportunity is designed to be mastered by anyone, Filta has identified several key personality factors common in their most successful franchise owners. For this reason, they have become fairly selective in who they offer the opportunity to. Business experience is a plus, but by far the largest determinant of who they accept into their franchise system is a strong will to succeed. Filta Environmental Kitchen Solutions is not currently active in our directory, but here are some other recommended selections for you to explore.